Right here would be the place for a cheap “don’t be evil” joke, but I’ll let you fill in the blank. Google, via YouTube, is teaming up with… newschannel… Fox News to host a presidential debate for GOP candidates later this month. The debate will pose YouTube-submitted questions to candidates, a format first explored by the streaming site with CNN in 2007. YouTube users will be able to participate through Fox News’ YouTube channel, and viewers will be promoted to vote on the submitted questions ahead of the September 22nd event. 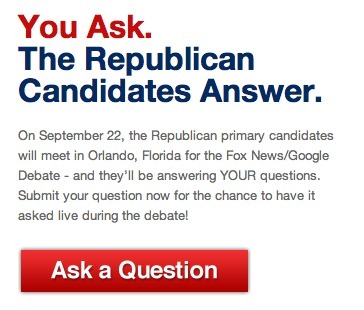 A statement from Fox says the network will “use the votes to help choose which questions are posed to the candidates” during the debate at the Orange County Convention Center in Orlando.